The Coat of Arms of Bearsden Burgh, 1959–75. Bearsden (/ˌbɛərzˈdɛn/ ( listen)) is a town in East Dunbartonshire, Scotland, on the northwestern fringe of Greater Glasgow. Approximately 6 miles (10 km) from Glasgow City Centre, the town is effectively a suburb, and its housing development coincided with the 1863 introduction of a railway line. The town was named after Bearsden railway station, which was named after a nearby cottage. Bearsden was ranked the seventh-wealthiest area in Britain in a 2005 survey and has the least social housing of any town in Scotland. The Roman Antonine Wall runs through the town, and the remains of a military bath house can be seen near the town centre. In 1649, the first New Kilpatrick parish church was built, which became the centre of administration for the area. The town's official Gaelic name Cille Phàdraig Ùr (meaning "new church of Patrick") reflects the name of the parish. By the early 20th century, a town had grown up with large townhouses, primarily occupied by wealthy commuter business workers. Further development of more affordable housing has increased the population of the town to approximately 28,000. Formerly a burgh, the town now has local government being the responsibility of East Dunbartonshire Council, but until 2011, the council had some departmental offices at Boclair House in Bearsden. 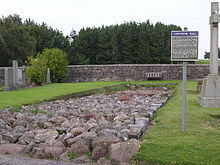 The first known settlement on the site of present-day Bearsden was a 2.5 acres (1.0 ha) Roman fort in the second century AD. 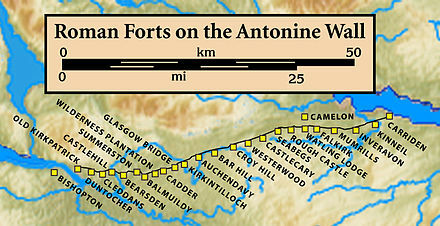 Between 142 and 144 AD, under Emperor Antoninus Pius, the Romans built a stone and turf fortification, called the Antonine Wall, between the Firth of Clyde and the Firth of Forth. They also built the Military Way, a road that ran parallel, to the south of the wall. The fort was positioned at the intersection of the Military Way, and the north-south road between Glasgow and Loch Lomond. A video reconstruction of the site has been produced. In 164 AD, after only 20 years, the Romans withdrew to Hadrian's Wall. Little of the fort remains today. However, close to the fort was a Roman bath-house, built in approximately 142–143 AD. The bath-house's remains were discovered by builders digging foundations for a housing development in 1973. The site was donated to the government, and today the remains lie, well-preserved, 150 metres (160 yd) from the town centre. Two further stretches of the Antonine Wall's stone base can be seen in the New Kilpatrick Cemetery on Boclair Road. Prior to 1649, the area formed part of a larger parish called Kilpatrick. One part was called West, or Old Kilpatrick, and covered Dumbarton and areas of west Dunbartonshire, such as Clydebank. The remaining part was named East or New Kilpatrick, covering a much greater area than Bearsden, from the River Clyde at Whiteinch and Yoker to Duntocher, Strathblane and Baldernock. Modern Bearsden began in an agricultural area as a small hamlet called New Kirk (or perhaps Chapelton) close to New Kilpatrick Parish Church, which was first built in 1649. Close landmarks included Canniesburn Toll, and a water mill at Garscube. The present-day church was built in 1807. The size and style of the community prior to urbanisation is recorded in Rambles Round Glasgow, first published in 1854. The author describes a route from Maryhill, crossing the River Kelvin at Garscube Mill to Canniesburn. At that point, the route takes the road to Drymen, rather than the alternative to Milngavie. Of particular note are the woods and gardens surrounding the fine houses of Killermont and Garscube, which are contrasted with a small shop at Canniesburn with apparently nothing left for sale. The kirk-toun (modern Bearsden Cross) is described as consisting of about a dozen cottages of idyllic rural beauty, isolated from the noise and dirt of Glasgow. The account also includes one of the earliest references to "Bear's Den", and although the location is not clear, a traditional belief is recorded that it was a Roman burial site. The New Kirk settlement grew from the middle of the nineteenth century when Glaswegian businessmen built houses at a commutable distance from the city. In 1863, the Glasgow and Milngavie Junction Railway opened, with a station near New Kirk called Bearsden. This was soon adopted as the name of the community. The opening of the railway led to considerable development of Bearsden, with many large Victorian houses built in what is now known as Old Bearsden Conservation Area. The Glasgow Reformatory for Girls at East Chapelton (also known as East Chapelton Home and Hillfoot Residential School) moved from Rottenrow to Bearsden in the late 1860s. Managed by Glasgow Corporation, the countryside location moved the girls away from any malign influences to be found in the city and allowed the institution to be self-supporting with livestock and a vegetable garden. The girls washed their own clothes and those of local residents in the Reformatory's large laundry. In addition to girls who had fallen foul of the courts, others with problems such as malnourishment and learning difficulties were also housed at Chapelton. In 1949, around 360 girls passed through the school annually and were taken to New Kilpatrick Parish church on Sundays. The school closed in the early 1970s and after a brief period as a hall of residence for the Nautical College, the building was demolished to make way for a shopping centre with an Asda supermarket. Buchanan Retreat was built in 1890 by the Buchanan sisters of Bellfield, near Kilmarnock, in Ayrshire. It was taken over by Bearsden Burgh in 1962 and, known as Boclair House, used as council offices (pictured below under Administration). Latterly used by East Dunbartonshire council, it was placed on the market in 2012 following council cost-cutting measures and staff redistribution. In 2016 the building opened as Boclair House Hotel, a hotel, wedding venue, and restaurant, which has since won several awards. The Schaw Home (pictured) was built in 1895 by Miss Marjory Shanks Schaw in memory of her brother and gifted to Glasgow Royal Infirmary. The building has now been split into private residential apartments. In 1906, many buildings were built at Bearsden Cross by Mathew Henderson (he also tried, unsuccessfully, to develop another commuter suburb at Drumchapel). Westerton Garden suburb was built around 1913 and is also now a conservation area near Westerton station. Near this is the site of the former Canniesburn Hospital, which has many Art Deco buildings and where pioneering plastic surgery was performed, notably on the Boy David who was featured on many television programmes and was adopted by one of the doctors there. The hospital site has now been developed into flats, but much of the character has been retained and copied. A further station in Bearsden is at Hillfoot. Bearsden continued to expand in the twentieth century as residents built large independently designed villas, estates of bungalows, and other types of houses. Few sites are now left unoccupied. In 1958, Bearsden became a Burgh. Then, in 1975, it became part of Bearsden & Milngavie District Council. Since 1996, it has been the largest of the five major towns of East Dunbartonshire Council. Bearsden was first known as Kirktoun(e) or New/Easter Kilpatrick village, all of which relate to the parish church situated in the centre of the town. There is no evidence that the village itself (rather than the parish) was ever called "New Kilpatrick" by locals (by the mid 19th century the houses near to the church had come to be called New Kirk). Nevertheless, the name appears over the village on old maps (see image below) and the town's official Gaelic name is Cille Phàdraig Ùr. The Scots language records of the Parliament of Scotland prior to the Acts of Union 1707 use the names Easter Kirkpatrick and Eister Kilpatrick for the parish. It could be related to Gaelic, meaning "entrenchments of the fort"
The most common explanation is that the sons of a local laird once kept a pet bear in a den there, but there is no evidence to support this. To quote James McCardel, the wisest course is frankly to admit that the derivation [of the name of Bearsden] is unknown. The mural coronet shows that these arms belong to a municipal Police burgh in Scotland. The field (or shield background) is gold, a colour taken from the Arms of the Clan Campbell of Succoth (Garscube Estate). The engrailed black diagonal stripe and the buckle are modified from the arms of the Campbell-Colquhouns (of Garscadden and Killermont); representing the three estates upon which much of Bearsden is now built. The rose is taken from the arms of Lennox, representing Dunbartonshire. The lower portion is an example of Canting arms - it represents the name of the town as a rebus, with a bear apparently looking into a den, while muzzled in traditional heraldic style. The Scots motto on the Bearsden coat of arms is "Bear the Gree" (a phrase occurring frequently in Scots literature from about 1420, including in Robert Burns' A Man's a Man for A' That) which means 'to hold or win first place'. There are two secondary schools in the town, Bearsden Academy and Boclair Academy which both have academic performance "well above average". These are fed by eight primary schools within the town (Boclair Academy's fourth feeder primary is located outside Bearsden in Torrance) and a small number of placing requests from other areas. The High School of Glasgow has a primary school section in the town – this is the result of a merger between the school and the former Drewsteignton Home School, founded in 1922. The expansion of the town of Bearsden, as shown through maps of the area from 1832. Bearsden is primarily a middle-class commuter suburb, with its residents travelling into Glasgow each day to work or study. The majority of its housing stock is detached. According to the 2001 census of Scotland, the area comprises 10,417 households, with a total population of 27,967. This is an increase of 0.6% (or 161 people) since 1991, when the population stood at 27,806 (there are an average of 2.64 people per household). Of these, 8,306 are over 55 years old, 17,700 are in social class ABC1, and 6,052 are in social class C2DE. A similar population figure was estimated in 2010 for the two council wards (27,551). 73% of working residents surveyed travel to work by car, 16% by train or bus, 5% by other methods, and 6% work mainly at home. Many of the west of Scotland's most expensive houses are in the Old Bearsden Outstanding Conservation Area – Bearsden's postcode (G61) was ranked 7th richest in the UK by a 2005 survey, with an estimated 176 millionaires living there. By comparison, just 235 people were estimated to be receiving Jobseeker's Allowance in 2011. The graphic is a summary of maps of the area since 1832. These demonstrate the growth of the town to its current extent from a large number of disconnected dwellings to a large settlement spreading from the New Kirk area. The relative size of houses (and corresponding affluence of households) tends to increase with age, but this is not a strict rule. Boclair House, formerly Buchanan Retreat, Bearsden, built 1890. Used by East Dunbartonshire Council's Education Department until 2012, it is now a hotel with housing to the rear. Bearsden forms two East Dunbartonshire Council wards (there are eight in total), called Bearsden North and Bearsden South. Each Ward has three councillors elected through a single transferable vote system. Bearsden North is part of the Clydebank and Milngavie constituency in the Scottish Parliament. The MSP is Gil Paterson (SNP); elected on 5 May 2011. Bearsden South is part of the Strathkelvin and Bearsden constituency in the Scottish Parliament. The MSP is Fiona McLeod (SNP); elected on 5 May 2011. Both constituencies form part of the West of Scotland regional list in the Scottish Parliament. The town is also part of the East Dunbartonshire constituency in the UK Parliament at Westminster. The current MP is Jo Swinson of the Liberal Democrats who defeated incumbent John Nicolson (SNP) at the snap general election in 2017. Bearsden can be accessed by rail from Bearsden, Westerton or Hillfoot stations. The town centre (also known as Bearsden Cross) is located at the intersection of the A809 (Drymen Road) and A808 (Roman Road). It was formerly known as New Kirk, as can be seen on postcards from the early 20th century. There are a number of shops in the area, representing most retail sectors, including a small supermarket. There are four functioning church buildings (Bearsden Cross Parish Church, All Saints Episcopal Church, New Kilpatrick Parish Church and St. Andrew's Roman Catholic Church ) a primary school, Bearsden Burgh Hall and Brookwood Public Library. Bearsden Ski Club and the Roman bath-house (across from which is Bearsden Baptist church and the Scout Hall of the 24th Glasgow Scout Group) lie on the edge the town centre. The former Bearsden North Church is a listed building, but is currently unused and is awaiting redevelopment proposals. Old Bearsden describes the area in Central / West Bearsden which are some of the most desirable residential areas of the country with sizeable sandstone villas. In 1855, John Campbell Colquhoun (a director of the Glasgow & Milngavie Junction Railway Company) drew up plans for house-building near Bearsden Station. Ledcameroch Road and Crescent were part of this plan, but the remainder was never completed as intended. Three of the largest houses, (Ledcameroch, St Germains and Lochbrae) were demolished and redeveloped between 1977 & 1985. The term now generally includes Bearsden Cross. Westerton is to the Southwest of the town, particularly the conservation area of 1920s buildings, shops, library and church around Maxwell Avenue, having clear boundaries with Drumchapel, Knightswood and Netherton in Glasgow. It has its own train station, Westerton railway station and primary school (Westerton Primary School). Castlehill/Courthill and Baljaffray lie to the Northwest of the town, and principally compose of post-1970 developments. The name Castlehill relates back to the presence of a Roman fort along the line of the Antonine Wall, although this is no longer visible. Modern Baljaffray was built in two phases; the residential areas, school and shopping precinct of South Baljaffray in the early 1970s were followed in the 1980s by further housing North Baljaffray – the two areas are divided by Baljaffray Road. Baljaffray has had a primary school since 1974, the logo of which represents a mine wheel, reflecting the coal-mining history of the area until the closure of the workings in 1910. Mosshead lies to the North of the town, having a boundary with Milngavie. Hillfoot lies to the East of the town centre, and was once a large house, demolished and built on in the first half of the 20th century. Kessington and Killermont cover the remainder of the East of Bearsden, a rough dividing line between the two being from Kessington Hall to Boclair Academy. Chapelton is shown on some of the oldest maps of the area. Originally just a few houses on Drymen Road south of Bearsden Cross, the area now covers the area between Milngavie Road, Drymen Road and Roman Road. To the South and West of Chapelton is Canniesburn, formerly the site of a tollhouse and smithy, now a huge roundabout. Canniesburn Hospital was partly demolished after its closure in 2001 and premium residences now stand on the site. Julia Donaldson, author of The Gruffalo and other children's books, lived in the town. Gruffalo sculptures have been placed around Kilmardinny Loch (see photo). Mark Macqueen, powerlifting record holder. Mark is a Scottish, British, European and World powerlifting champion. Mark Knopfler, front-man and co-founder of Dire Straits, attended Bearsden Primary School for two years before his family moved to England. The Bearsden Amateur Football Club was constituted in 1890 and its founders were drawn mainly from the employees of the staging post, originally situated at Bearsden Cross. Their first ground was in Drymen road, now the site of the public hall and All Saints church and when the ground was re-developed the club moved on to Station Road where they played until the club disbanded on the outbreak of war in 1914. In 1919 the club reformed and played for the first time on their present ground at Thorn Park. The club won the Scottish Amateur Cup in 1961–62, beating Pencaitland 1-0 at Hampden Park. Presently they participate in the Caledonian Amateur Football League and other cup competitions. Westerton United (1997) and Baljaffray FC, established 2002, are the most recent new football clubs in Bearsden. Georgian neoclassical style club house of Glasgow Golf Club, built 1805. The Glasgow Golf Club is one of the world's oldest, founded in 1787. In 1904 the club moved premises to Killermont House and its surrounding estate, built in 1805 for the Campbell-Colquhoun family. The club is unusual in having a links course (at Gailes, near Irvine) in addition to its home course. Bearsden Golf Club, to the East of Bearsden Cross, has a nine-hole course, with seven alternative greens, thus enabling a full round to be played. Its layout has not changed significantly from its foundation in 1891. Douglas Park Golf Club, Hillfoot, has a full course and can trace its history back to 1897, although the current layout dates from 1972. Windyhill Golf Club (founded 1908), West of Baljaffray, has an 18-hole course laid out by James Braid, who subsequently modified Glasgow Golf Club's Killermont course 16 years later. The course has views of the River Clyde, Campsie Fells and Kilpatrick Hills. Bearsden also has a driving range near Hillfoot Station, which not associated with any of the established clubs. Highland Games for Bearsden and Milngavie are held annually at the West of Scotland Rugby Ground. Bearsden Ski Club was formed circa 1964 by a small band of enthusiasts. The club has a membership of about 1200 skiers, boarders and social members. The club facilities include the Main alpine slope, two nursery slopes, a freestyle slope and a club house, it also currently undergoing further renovation. It provides a wide range of activities from skiing cross-country on one of their trips to tubing on the freestyle slope. Bearsden have a competitive chess club, with one team from the club winning the Glasgow Division 1 League outright in 2010. There are two Scout Groups in Bearsden. The 24th Glasgow (Bearsden) Scout Group, was formed in January 1908 and is one of the largest Groups in the UK with four Beaver Colonies, four Cub Packs, three Scout Troops and an Explorer Unit, as well as providing a meeting place for Scout Network. There is a published history of the group. The group is known for its many international camps, including a biennial visit to the Kandersteg International Scout Centre since 1949 and currently has over 600 members. The 183rd Glasgow Scout Group, was formed in 1947 by the Home Guard and has two Beaver Colonies, two Cub Packs, one Scout Troop and an Explorer Unit. It currently has over 130 members. Like the 24th, it goes on many international camps during the summer holidays to Germany, Canada, Belgium, and more recently, Croatia. Both Groups are part of the Clyde Region of the Scout Association. Girlguiding is also active in Bearsden, with units based at Killermont Parish Church and at the Guide Hut in Pendicle Road. The local units are members of the Girlguiding Dunbartonshire. Bearsden has three Boys' Brigade Companies. The 1st Bearsden Company of the Boys' Brigade, Founded in 1898. The Company has three sections – Anchor Boys, Junior Section and Company Section. The 2nd Bearsden Company of the Boys' Brigade, attached to the Westerton Parish Church which was established in 1957, but the BB Company can trace its history back to before that date. The 3rd Bearsden Company of the Boys' Brigade is attached to the Killermont Parish Church. ^ Evox Facilities. "List of UK post towns". Evox Facilities. Archived from the original on 19 February 2012. Retrieved 22 February 2012. ^ "Bearsden in East Dunbartonshire (Scotland)". CITY POPULATION. Retrieved 2 December 2017. ^ "Bearsden_Comp". Retrieved 5 December 2018. ^ Miller, Phil (3 June 2016). "Pasta, braziers, poppies, figs, coriander and bread: How the Romans lived in Bearsden, nearly 2000 years ago". Herald Scotland. Retrieved 1 December 2017. ^ Symonds, Matthew (8 August 2016). "Book Review: Bearsden – A Roman Fort on the Antonine Wall by David J Breeze". Current Archaeology. Retrieved 6 May 2018. ^ Martin McCarthy. "Bearsden Bathhouse". Ancient Scotland. Retrieved 1 February 2012. ^ "Property Detail". historic-scotland.gov.uk. Retrieved 19 January 2012. ^ a b c d e f g h i McCardel, J (1949). The Parish of New Kilpatrick. University Press Glasgow. ^ MacDonald, Hugh (1856). "17". Rambles Round Glasgow (2nd ed.). Thomas Murray & Son. pp. 321–325. Retrieved 25 July 2013. ^ "Site Record for Bearsden, East Chapelton Home East Chapelton Reformatory; Hillfoot Residential School Contribution". canmore.rcahms.gov.uk. Retrieved 19 January 2012. ^ "Glasgow Reformatory for Girls". TheGlasgowStory. Retrieved 19 January 2012. ^ McCardel, J (1973). New Kilpatrick Parish and its Story. Bell & Bain, Glasgow. ^ "Historic house goes under the hammer at 1.5m – Local Headlines". Milngavie Herald. 1 January 2012. Retrieved 20 January 2012. ^ "Workers are moved in council's cash cut bid – Local Headlines". Milngavie Herald. 17 June 2011. Retrieved 20 January 2012. ^ "Nearly 70 weddings booked at Boclair House Hotel already!". Milngavie & Bearsden Herald. 9 March 2016. Retrieved 29 August 2016. ^ a b c d McKinlay, W (1997). Old Bearsden. Stenlake Publishing. ISBN 1-84033-011-2. ^ Controller of Audit to the Accounts Commission (May 2009). "The Audit of Best Value and Community Planning – East Dunbartonshire Council". Scottish Government. Retrieved 3 May 2012. ^ K.M. Brown; et al., eds. (2007–2010). The Records of the Parliaments of Scotland to 1707. University of St Andrews. pp. 1649/1/140. Retrieved 15 March 2013. ^ K.M. Brown; et al., eds. (2007–2010). The Records of the Parliaments of Scotland to 1707. University of St Andrews. pp. 1672/6/14. Retrieved 15 March 2013. ^ MacDonald, Hugh (1856). "17". Rambles Round Glasgow (2nd ed.). Thomas Murray & Son. p. 325. Retrieved 25 July 2013. ^ Burke, Sir Bernard (1884). The general armory of England, Scotland, Ireland, and Wales. Harrison & Sons. p. 217. ^ "Bearsden Academy Inspection Report" (PDF). Education Scotland. 19 January 2016. Retrieved 8 September 2017. ^ "Boclair Academy Bearsden Inspection 17/03/2009" (PDF). Her Majesty's Inspectorate of Education. 17 March 2009. Archived from the original (PDF) on 8 September 2017. Retrieved 8 September 2017. ^ a b "East Dunbartonshire Council Wards – Ward 2 Bearsden North" (PDF). East Dunbartonshire Council Corporate Planning & Performance Team. Archived from the original (PDF) on 19 October 2015. Retrieved 14 April 2015. ^ a b "East Dunbartonshire Council Wards – Ward 3 Bearsden South" (PDF). East Dunbartonshire Council Corporate Planning & Performance Team. Archived from the original (PDF) on 24 September 2015. Retrieved 14 April 2015. ^ "News". eurodirect.co.uk. Retrieved 19 January 2012. ^ "Hotel plans for Boclair House". Milngavie Herald. 27 April 2014. Retrieved 13 April 2015. ^ "Democracy Live | Your representatives | Gil Paterson". BBC News. Retrieved 19 January 2012. ^ "Democracy Live | Your representatives | Fiona McLeod". BBC News. Retrieved 19 January 2012. ^ "Bearsden". Bearsdencross.co.uk. Retrieved 19 January 2012. ^ "New Kilpatrick Church". nkchurch.org.uk. Retrieved 19 January 2012. ^ "Contacts". St Andrew's RC Church Bearsden. Retrieved 20 March 2017. ^ "Bearsden Primary School – Home". bearsden.e-dunbarton.sch.uk. Retrieved 19 January 2012. ^ "Drymen Road, Bearsden North (church of Scotland) Church Including Church Hall and Gatepiers – Milngavie – East Dunbartonshire – Scotland". British Listed Buildings. 25 April 2002. Retrieved 19 January 2012. ^ "Heritage plan for Bearsden church – Local Headlines". Milngavie Herald. 9 July 2010. Retrieved 19 January 2012. ^ "Ledcameroch". Retrieved 31 October 2016. ^ "Baljaffray Primary School – Home". baljaffray.e-dunbarton.sch.uk. 20 January 2011. Retrieved 19 January 2012. ^ Dilke and Templeton (1959). The county of Dunbarton (Volume 6 of The Third statistical account of Scotland). Collins. p. 21. ^ "Canniesburn Plastic Surgery Unit – News". canniesburn.org. Archived from the original on 3 August 2012. Retrieved 19 January 2012. ^ "Canniesburn Flats, Glasgow, Architect, Bearsden Flats, Canniesburn Property". glasgowarchitecture.co.uk. Retrieved 19 January 2012. ^ Desmond, Ray, ed. (1994). Dictionary of British and Irish botanists and horticulturalists : including plant collectors, flower painters and garden designers ([Rev. and updated ed.]. ed.). London: Taylor & Francis. p. 10. ISBN 0850668433. ^ "Bearsden Children's author Julia Donaldson backs schools campaign". Bearsden & Milngavie Herald. 12 January 2013. Retrieved 19 January 2013. ^ "Hope Is Running Out for Home Fit for a Poet; Morgan Fears for Residents – herald uk – July 22, 2004 – Id. 66009335 – vLex". herald.vlex.co.uk. 22 July 2004. Archived from the original on 12 July 2012. Retrieved 19 January 2012. ^ Morgan, Edwin (1996). Collected Poems. Carcanet Press. ISBN 1-85754-188-X. ^ Sample & Devlin (4 October 2016). "British trio win Nobel prize in physics for work on exotic states of matter". The Guardian. Retrieved 6 October 2016. ^ Sturrock, Laura (5 October 2016). "Bearsden scientist is awarded Nobel prize in Physics". Kirkintilloch Herald. Retrieved 6 October 2016. ^ "Lord Macfarlane of Bearsden". parliament.uk. 3 June 2010. Archived from the original on 16 October 2011. Retrieved 19 January 2012. ^ "Alec Spalding". Herald Scotland. 18 October 2007. Retrieved 19 January 2012. ^ "Know Your Area". ionmagazine.co.uk. Archived from the original on 16 September 2008. Retrieved 19 January 2012. ^ "Players | Players Alphabetical | Players Alphabetical | Alan McManus". World Snooker. Archived from the original on 30 December 2011. Retrieved 19 January 2012. ^ Maclean, Ian (30 March 2017). "Bearsden strongman lifts four European titles". Milngavie and Bearsdewn Herald. Retrieved 2 May 2017. ^ "Henry Winter: Sir Alex Ferguson understands intense pressure of Premier League". London: Telegraph. 15 August 2009. Retrieved 19 January 2012. ^ Sharp, Rob (2 March 2011). "Edwyn Collins: The pop star who answered the call of nature – Features – Music". London: The Independent. Retrieved 19 January 2012. ^ Cameron, Gail (2 September 2011). "Machete terror of Wet Wet Wet girl | The Sun |Home Scotland|Scottish News". thescottishsun.co.uk. Retrieved 19 January 2012. ^ Bendoris, Matt (2 January 2010). "Darius drops Danesh for TV show | The Sun |Home Scotland|Scotland Features". London: The Sun. Retrieved 19 January 2012. ^ Kapranos, Alex. Interview with Craig Ferguson. "The Late Late Show with Craig Ferguson." CBS. 6 February 2009. ^ "Knopfler and Darius join campaign to save school". The Herald. 21 December 2012. Retrieved 17 April 2013. ^ Barry, Maggie (31 October 2010). "Scots drivetime BBC radio host on fighting talk fuelling on-air duels". Sunday Mail. Archived from the original on 6 December 2010. Retrieved 15 February 2013. ^ "Moira Shearer – Obituaries – News". London: The Independent. 3 February 2006. Retrieved 19 January 2012. ^ "Scottish Amateur Cup Winners (1909–2009)" (PDF). Scottish Amateur Football Association. Archived from the original (PDF) on 20 August 2012. Retrieved 28 August 2012. ^ "Bearsden Amateurs FC – Home". bearsdenafc.co.uk. 12 June 2010. Archived from the original on 20 July 2012. Retrieved 20 January 2012. ^ Clarke, Fraser (4 March 2018). "WESTERTON UNITED FOOTBALL CLUB". Westerton United. ^ "Baljaffray football Club". baljaffrayfc.co.uk. 10 February 2012. Retrieved 13 February 2012. ^ "Bearsden". Scottish Golf Courses (Bearsden). PSP Publishing Ltd. Retrieved 23 April 2012. ^ "Douglas Park". 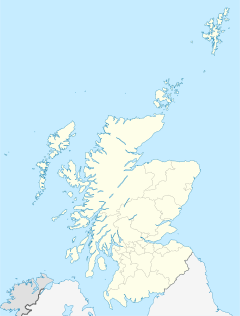 Scottish Golf Courses (Douglas Park). PSP Publishing Ltd. Retrieved 23 April 2012. ^ "Club history". Douglas Park Golf Club. Archived from the original on 21 August 2008. Retrieved 23 April 2012. ^ "Windyhill". Scottish Golf Courses (Windyhill). PSP Publishing Ltd. Retrieved 11 May 2012. ^ "Club website". Windyhill Golf Club. Archived from the original on 18 May 2012. Retrieved 11 May 2012. ^ "Bearsden & Milngaviehighland Games – Home". bearsdenmilngaviehighlandgames.com. 12 June 2010. Archived from the original on 7 March 2012. Retrieved 19 January 2012. ^ "Welcome to West of Scotland Snowsport Centre – Home of Bearsden Ski Club". skibearsden.co.uk. Archived from the original on 6 December 2011. Retrieved 19 January 2012. ^ Douglas MacGregor. "Bearsden Chess Club". bearsdenchessclub.freeserve.co.uk. Archived from the original on 16 December 2011. Retrieved 19 January 2012. ^ a b Alec J. Spalding, The 24th 1908–1988: a history of the 24th Glasgow (Bearsden) Scout Group, ISBN 0-9513439-0-4. ^ "(Bearsden) Scout Group – The 24th". 24th Glasgow. 9 January 2009. Archived from the original on 7 March 2012. Retrieved 19 January 2012. ^ "(Bearsden) Scout Group – Sections". 24th Glasgow. 9 January 2009. Archived from the original on 7 March 2012. Retrieved 19 January 2012. ^ "(Bearsden) Scout Group – Welcome to the 24th site". 24th Glasgow. 9 January 2009. Retrieved 19 January 2012. ^ "Home – 183rd Glasgow Scout Group | Where The Fun Begins!". 183rdglasgow.co.uk. Retrieved 19 January 2012. ^ Conceptulise Website Management System; www.conceptulise.com. "Welcome to the adventure – 183rd Glasgow Scout Group". ^ "Girl Guiding Dunbartonshire". Girl Guiding Dunbartonshire. Retrieved 19 January 2012. ^ "1st Bearsden BB". 1st Bearsden BB. Retrieved 19 January 2012. Wikimedia Commons has media related to Bearsden.